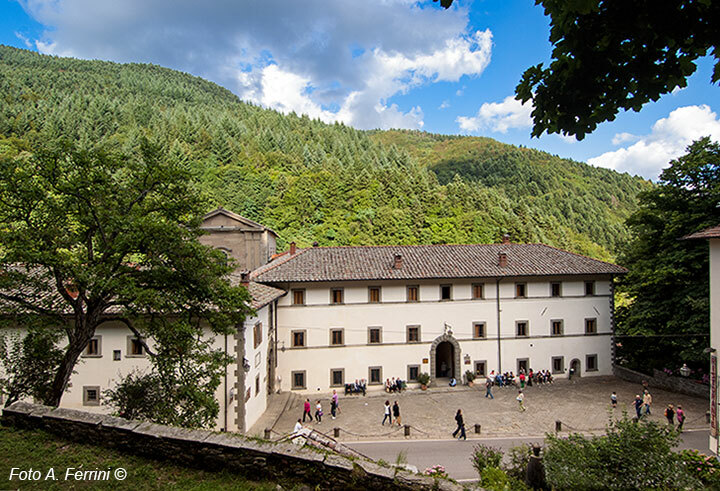 Camaldoli Monastery, a place of art and faith in the forest. Camaldoli Monastery is located in the eastern part of Tuscany, on the Tosco-Romagnolo Apennines at a height of 820 meters, next to a moat that quickly descends towards the torrent Archiano; this torrent is the same one mentioned by Dante Alighieri in the 5th Canto of Purgatorio, regarding the never found dead body of Bonconte da Montefeltro, who died in the battle of Campaldino in 1289. From Romagna you can arrive to the great abbey by taking the road of the Mandrioli Pass that starts at Bagno di Romagna. Camaldoli Monastery can be reached from the underlying Tuscan valley of Casentino by taking the Mandrioli road and turning left once you arrive at the crossroad located a few kilometers passed Partina. Otherwise, it can be reached from Poppi through the road that goes towards Maggiona. The origins of this great abbey complex are dated back around the year one thousand, when the Benedettini monks of the close Abbey of Prataglia built a small church and a sort of hospice in this area; an area that was called Fontebona because of the presence of a spring that used to provide lots of quality water. Only a few decades later (1046 is the "remembered" date), on an invitation of Arezzo Bishop, this structure was taken under the care of the Camaldolesi monks that lived in the hermitage above, and it was made much more efficient in its hospitality, which was also a shelter for pilgrims.The hospital expanded during the years, and the church that had been damaged by a fire at the beginning of the 13th century was rebuilt in the following years. 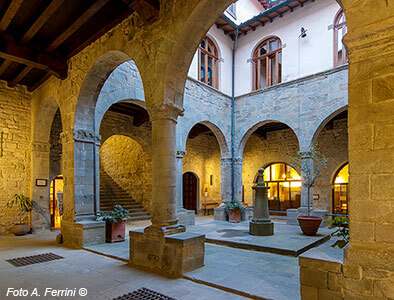 In the early '500 it was rebuilt once again and was decorated with works of art by Giorgio Vasari; at a later time, around the chuch and the hospital, the building of the abbey complex started and today we can admire it in all its greatness. Construction finished in 1611. 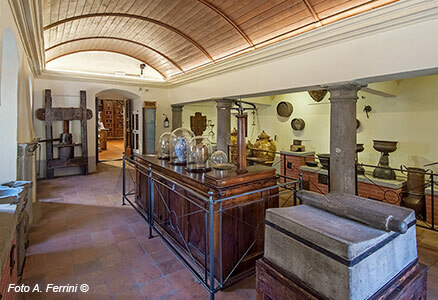 Nowadays Camaldoli Monastery is a great and well-known center of spirituality. Its guestrooms can host one-hundred and seventy people, and it is often filled up by people that arrive during the most solemn religious moments of the year, or for taking part in religious meetings and conferences that are organised in this sacred place, which is also important for its architecture and for the quality art that it can offer. The most appealing points of the Camaldoli Monastery are: the inner cloisters, mostly the first one dedicated to Count Maldolo; the church, where Giorgio Vasari's works are kept; and the famous pharmacy, where it is possible to both visit the ancient galenical laboratory with its original tools and buy the monks' medicinal products, spirits, soaps, creams, balsamic candies, and the well-known chocolate. Camaldoli Monastery has a very fashinating area where, unfortunately, the normal tourist cannot access. It is possible to virtually visit several of its parts by this web section, as they are part of the monks' seclusion. Tourists also can visit this great abbey more and more often because of the wonderful nature that surrounds it, for a Sunday trip or even for staying a few days. In fact, Camaldoli can be considered the "religious hearth" of the National Park of Casentino forests, Falterona Mountain and Campigna. The Camaldolese monastery is therefore a perfect starting point for both relaxing walks, as the one towards the famous Miraglia Chestnut Tree, and long excursions among spruce and centuries-old beech trees.